Another Little Free Library popped up in the Top of the World neighborhood this week. 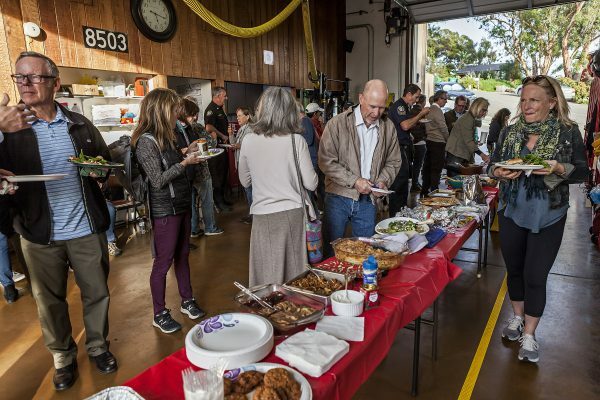 A community potluck took place on Wednesday to celebrate the installation of the bright red, peaked roof book exchange box, which now sits at the corner of Alta Laguna Boulevard and Tree Top Lane in front of Fire Station 3. 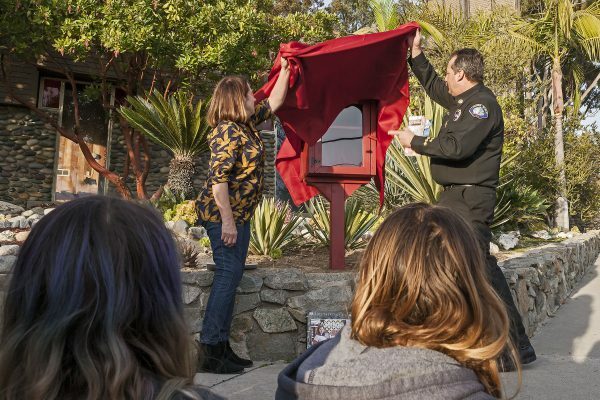 TOW resident Ellen Girardeau-Kempler and Fire Chief Mike Garcia unveil Laguna’s newest Little Free Library in front of Fire Station 3 on April 3. Photo by Mitch Ridder. “The idea for the library came up when the TOW Transition Laguna group took part in a community event to plant succulents in front of Fire Station 3, followed by a potluck at our home,” said neighborhood resident Ellen Girardeau-Kempler. When the firefighters saw Girardeau-Kempler’s library at 2885 Chillen Way, they suggested a Little Free Library would be a nice addition at the station. In 2009, Todd H. Bol created the first Little Free Library book exchange and placed it in his Hudson, Wisconsin front yard in tribute to his mother, who had been a teacher. Now celebrating its 10th year, Bol’s idea has snowballed into a worldwide book-sharing movement. Today, there are more than 80,000 Little Free Libraries in all 50 states and more than 90 countries from Argentina to Zambia. Girardeau-Kempler submitted an application to Little Free Library’s Impact Library Program, which places libraries in neighborhoods with the goal of deepening community connectedness. Her request to receive a library, free of charge, was approved last August and the planning began. Kits to build the book boxes, which can be purchased online from the organization, typically run from $149-$359 for basic models. The posts for installation are extra. : Ellen Girardeau-Kempler, the steward for Fire Station 3’s Little Free Library, stocks some books during an unveiling and community potluck on April 3. Photo by Mitch Ridder. “This is an especially well-timed gift that symbolizes the important partnership between communities and their fire departments in fire preparedness, prevention and safety,” Girardeau-Kempler said. Fire Station 3 was the staging area for the fight against the June 2018 wildfire that forced evacuation of the TOW neighborhood. 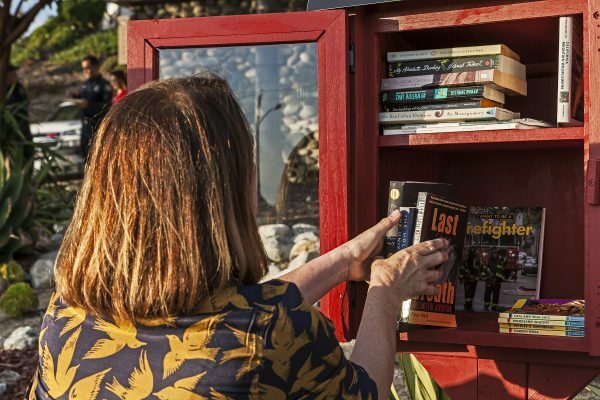 With the addition of the Fire Station 3 library, there are now nearly a dozen Little Free Libraries located throughout Laguna Beach. There’s a self-built one in the village named The Book Barn, one at Laguna College of Art and Design, and one at 499 Legion Street, stewarded by Lois Wilcox, who was the TOW school librarian for 25 years. Wilcox’s library was a gift from her daughters for her 85th birthday. The Pacific Marine Mammal Center received a Little Free Library as a result of a collaboration with The Annenberg Space for Photography, which wanted to place a library in the Orange County area in conjunction with their library-based exhibit, “Not an Ostrich and Other Pictures” from the Library of Congress. “We jumped at the chance to work with anther nonprofit organization with positive community impact,” said Krysta Higuchi, PMMC events and public relations coordinator. The TOW community celebrated the addition of a Little Free Library on April 3 with a potluck. Photo by Mitch Ridder. Robin Walsh, who lives in a gated South Laguna community, said her Little Free Library brings neighbors of all ages together and has even spawned two book clubs. Local artist Jeff Rovner, a North Laguna resident, installed his library four years ago. “It’s been great for us, and I think good for the neighborhood,” he said, adding that a steady stream of passersby stop to browse for books. Acting as steward for the fire station’s library, Girardeau-Kempler plans to stock books with an environmental bent, like Shel Silverstein’s “The Giving Tree,” Dr. Seuss’ “The Lorax,” Richard Powers’ “Overstory,” and Joan Didion’s “White Album.” Building on that theme, she also hopes to include guidebooks to local flora and fauna, and city literature on water conservation and fire prevention and safety. The steward assists with maintenance of the library and must organize at least one community program in the year ahead. Girardeau-Kempler will register the new addition to her neighborhood on the Little Free Library world map. To view all the Little Free Libraries in town, visit litlaguna.comor Little FreeLibrary.org.